Adobe reader is the most essential PDF viewer . 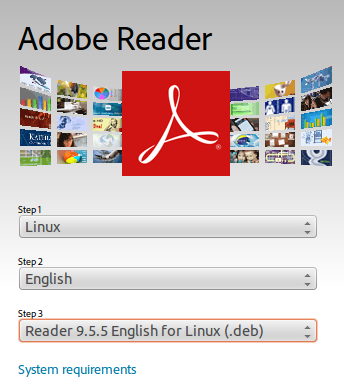 This guide helps you to install adobe reader in ubuntu 14.04 Desktop. As of now adobe reader is not included in the official ubuntu 14.04 repository. you need to download and install Manually . Adobe has already released .dep package for debian which can be used for ubuntu 14.04. Install adobe reader in ubuntu 14.04. Step 1 » Update repositories ( Might required for 64 Bit ). Step 3 » Now open terminal ( ALT+CTRL+T ) and change the permission for the Downloaded file . Step 4 » Install the downloaded package using the below command. That’s it … you can now use adobe reader . For ubuntu 64 bit users the above command will result in some dependencies error . This is because you are trying to install 32 bit package on 64 bit OS . you need to install 32 bit dependencies . » Issue the below command after the above step to install required dependencies . » and the below command for installing other required dependencies. Now you can open adobe reader on 64 bit OS . Option was there earlier, But now it is removed . you can use this direct download link . Worked great for me, thanks so much!